U.S. senator from South Dakota, 1963-81. Democratic candidate for president, 1972. Candidate for the Democratic presidential nomination, 1974. President of Middle East Policy Council. Founder o the McGovern Family Foundation, devoted to funding research to combat the problem of alcoholic women and relapse. (Methodist) Preacher's Kid. 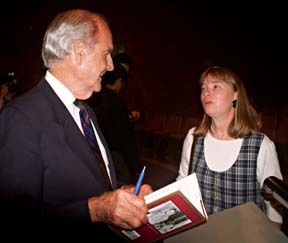 Picture of George McGovern taken during class discussion of his new book "Terry: My Daughter's Life-and-Death Struggle With Alcoholism" at McLeod Hall, University of Virginia on October 16, 1996. "I was in Parsons, Kansas., working on the newspaper. It was my first phone bank. Three of us called the entire city phone directory urging them to vote for McGovern. We didn't bother to keep a list of favorables because among the three of us we knew them all. It was Dole country, even then. " 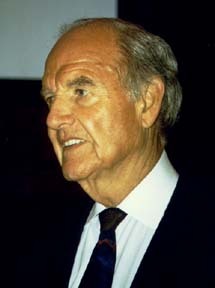 In fact, George McGovern lost every state in that election with the exception of Massachusetts. In the summer of 1972, President Clinton was a freshman at Yale Law School -- coordinating the McGovern campaign in Texas. He would tell me "if I can just get you in here one more time, we are going to carry the state. He had me finally going to places like Waco and El Paso." 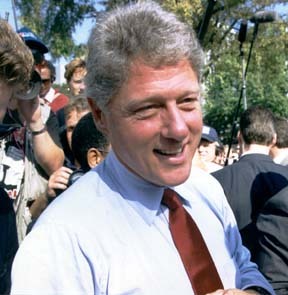 "When he was the nominee in 1992, he never went near the state of Texas. I told him after that election, I admired his idealism of '72 almost as much as his realism of '92." George S. McGovern has been confirmed as U.S. ambassador to the United Nations food and agricultural agencies in Rome. McGovern ran the Food for Peace Program for Jack Kennedy in '61 & '62 and this position will allow him to work on world hunger problems (Carl P. Leubsdorf interview with George McGovern, Dallas Morning News, April 5, 1998).